When I moved to Barcelona, I realised I had found my ideal city: wherever you are there is sure to be a well-stocked library no more than a fifteen-minute walk away. I first went to my local library to use the free internet. They all have computer benches where you can log on to using your library card number and passcode. You can also take your own laptop and use their wifi. Needless to say, they have a wide catalogue of books to borrow from, not just in Spanish and Catalan but also English and French. If in doubt, ask the staff. To get a free library card, just register at the desk with a piece of ID. 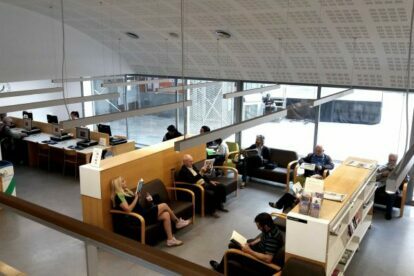 I regularly use two local libraries near me, one in Vila Olímpica where I like to work and enjoy the quiet and the other is in Fort Pienc where I wait for my son to finish his sports class and where I read the English language magazines. The library network also organises great cultural events throughout the city; their excellent web page can be viewed in English, so it’s easy to get informed and find the nearest library of course. When I find myself in other parts of town, I like to pop into any library I come across and enjoy their architecture. Most of the city’s libraries where built from the 1990s onwards and follow a functional and rationalist design which I love.